A war widow has finally visited the grave of a long-lost grandfather killed in France in WWI, after a Virgin Trains employee helped her track down his final resting place. The whereabouts of Private Thomas Bryan was a mystery his family had carried since he went to war in his best suit more than a century ago. It was eventually solved thanks to a chance encounter between his granddaughter, 85-year-old Rita Armin, and Virgin Trains employee Wayne McDonald last year after striking up a conversation on a Virgin Train to London..
Mr McDonald, an amateur war historian, helped find Private Bryan’s grave, and made a promise that he would take her to Northern France to pay her respects. Making good on that promise, Wayne accompanied Rita on the visit to Béthune Town Cemetery this week, travelling courtesy of Virgin Trains and Eurostar. Accompanied by her 23-year-old Grandson Sam, amidst emotional scenes, the pair laid wreathes at Thomas’ grave, and in doing so became the first family members to pay their respects in more than 100 years. Rita travelled down from Stockport on Virgin Trains, before a quick hop over to Lille on Eurostar. A short taxi ride later and Rita was finally able to get some closure. Private Thomas Bryan was laid to rest in 1915. The cemetery, now looked after by the Commonwealth War Graves Commission (CWGC), was created during the First World War to support the military hospitals established in the town. 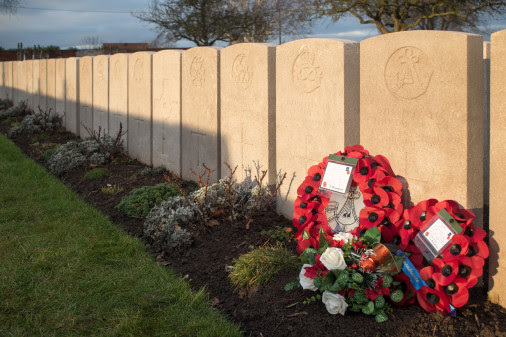 Today, it contains more than 3,000 Commonwealth burials of the First World War and 19 Second World War graves. The cemetery also contains French and German war graves. Bethune is where the idea of commemorating our war dead first began. While working through what was then a temporary soldier’s cemetery, CWGC’s founder, Fabian Ware, felt something had to be done to remember the sacrifice of our service personnel. Before the First World War there was no system in place to record, mark or care for the graves of our war dead. Fabian Ware forever changed that and established the cemeteries and memorials that still stand today as focal points for our acts of remembrance. While travelling to London on a Virgin train from Stockport to Euston, the 85-year-old was assisted on her journey by Train Manager Wayne McDonald who just happened to be a war enthusiast. As Mrs Armin and Mr McDonald got chatting on the two-hour journey and it transpired that the family had been unable to find out where her Grandfather, Private Thomas Bryan of the 2nd Ox and Bucks Regiment, was buried since his death during the Great War in 1915. She asked Mr McDonald if he could anything to help find out the full story as he had an interest in the history of the conflict. A few days later Rita received an e-mail from Wayne with the most amazing information that he had tracked down the location of her Grandad’s grave. Not only this, but Mr McDonald visited Béthune Town Cemetery where Private Bryan was buried to pay his respects and take a photograph of the burial site for Mrs Armin. Bethune Town Cemetery is looked after by the Commonwealth War Graves Commission (CWGC). The CWGC cares for 1.7 million Commonwealth servicemen and women who died during the two World Wars and maintains their graves and memorials at 23,000 location in more than 150 countries and territories worldwide. Bethune is where the idea of commemorating our war dead first began. While working through what was then a temporary soldier’s cemetery, CWGC’s founder, Fabian Ware, felt something had to be done to remember the sacrifice of our service personnel. Before the First World War there was no system in place to record or mark or care for the graves of our war dead. Fabian Ware forever changed that and established the cemeteries and memorials that today still stand as focal points for our acts of remembrance.